AT&T customers are getting some galactic love with the arrival of the Samsung Galaxy S II on the carrier’s “4G” HSPA+ network. The Samsung Galaxy S II has been out in Europe for a few months now and the Sprint version, the Epic Touch 4G, has been out since September 16. The Samsung Epic Touch 4G is currently the top ranked phone on our Top 10 Phones chart due to its speediness, stunning display and its incredibly thin design. You can expect those same qualities from the AT&T Galaxy S II. 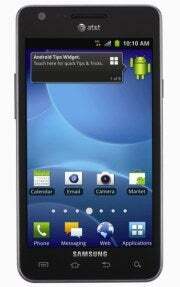 Like its CDMA brother, the AT&T Galaxy S II has a 1.2GHz processor, runs Android 2.3, has an 8-megapixel camera with video capture up to 1080p with a front-facing 2-megapixel camera for video chat and a Super AMOLED Plus display. It also has HDMI-out for streaming HD content (up to 1080p) on your HDTV. The HDMI connector will be sold separately. It also runs the latest version of TouchWiz, Samsung’s custom skin for Android, which you can read about in our review of the European Galaxy S II. The AT&T Galaxy S II has a slightly smaller display than the Epic Touch 4G (4.3 inches compared to 4.5 inches). My colleague, Melanie Pinola, got her hands on the AT&T version at the Galaxy S II US launch event and remarked that its design felt a bit more refined than the Epic Touch 4G. We’ll be reviewing the AT&T Galaxy S II in the next coming days so stay tuned for a full rated review.